New Year’s Resolutions? Here’s how to actually make them happen. A New Year’s Resolution is generally an ineffective way to reach a goal, as most people make their resolutions too generic. Most people aren’t quite ready to make a change when they make a resolution. I don’t see a need to wait until a new year to make changes for the better – you should be evaluating your life at the bare minimum every six months, but preferably on a monthly basis, and making changes as needed. This is especially true if you own a business. But this year is different. I’ve realized that just because new year’s resolutions are usually ineffective, mine don’t have to be that way. I’ve decided to make some resolutions after all, except instead of “resolution,” I’m calling them “themes” and “goals.” Because, as I’ve said it many times before, a dream is just a dream until you turn it into a goal. After that, it’s only a matter of time and planning before it becomes reality. Does it benefit my family life? Does it honour my sense of adventure and help our family embrace our sense of adventure? Does it honour my creative self? If the answer to any of these questions is no, I will think twice about making a commitment. But these are just general themes to keep in the back of my mind this year (and every year thereafter, I hope, because in 2015, I learned that living life on your terms is more important than keeping up with the status quo. This is where these themes came from in the first place). In order to really live my dreams in 2016, I’m going to have SMART goals. If you don’t turn your resolutions into SMART goals, they’re just dreams that will more than likely not turn into reality. If you must make resolutions, make them effective by using SMART goals. Here is a FREE tool you can use to ensure your goals are SMART. SMART is an acronym meaning your goals should be Specific, Measurable, Attainable, Relevant, and Time-Bound. “Making more money from my writing” is not a SMART goal. “I will make $5,000 from my writing by July 31st, 2016,” is a SMART goal. It is specific: I’m stating exactly how much I will make. It is measurable: On July 31st, I can look at my accounting, bank account, and budget software, and see if I’ve made $5,000 from my writing endeavours. It is attainable: $5,000 in 7 months is a realistic goal for a first-time writer. This works out to $714.29 per month. It is relevant: I want to become a published writer who gets paid for my words, so making money from my writing is a relevant goal for me. It is time-bound. I’m setting myself a deadline on which to check my progress. I’ll be taking a course to figure out how to gain exposure by writing for popular markets. I’ll continue researching and reading Writer’s Market 2016, in order to identify markets in which I can sell my writing/pitch articles for pay. I’ll blog both here and on the No Guilt Mama Blog* more frequently, so my audience has something to look forward to once they find me (from my exposure on other sites – my biggest referrals to this blog in 2015 were from the Good Men Project, on which I became a published author in 2015). I’ll finish reading Project Management for You, by Cesar Abeid, and I’ll use the concepts within it to publish my own book (more on this on a later post). I’ll use Brendan Baker’s excellent tool to plan out my year (and I’ll continue reading his stuff for inspiration). Now, if applicable, I can go back and see if each of the items above can be made into a SMART goal as well, or at the very least, if a full SMART analysis is unwarranted, I can give each item a “do by” or “do on” date, and add it to my year planning tool. In short, I’m making dreams into goals this year, and I’m going to accomplish them. The above is just one example of one of my goals this year. I’ll be sharing more of my goals with you in the weeks ahead. How about you? 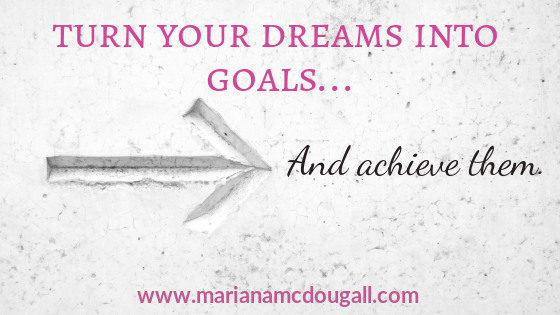 Which dreams are you turning into goals this year? What are your SMART goals for 2016? Please share in the comments below, and be sure to sign up for the mailing list for some great inspiration on getting things done this year. *Update: The No Guilt Mama blog no longer exists, as I now blog about a variety of things on this blog only. Previous Previous post: An open letter to those sharing anti-immigration sentiments on Facebook. Next Next post: Valentine’s Day? No thanks.